South America has a long and interesting coastline that includes stretches on the Caribbean, Pacific, and Atlantic oceans, and when it comes to beaches there are some excellent options to be found across the continent. Some countries are better known than others for their beaches, with Brazil and Colombia particularly noted for their fabulous beach destinations, while the landlocked countries of Bolivia and Paraguay have no ocean beaches at all. Brazil's extensive Atlantic coastline offers a great variety in terms of the beaches. There are also oceanfront stretches in cities like Rio and Florianopolis that have thriving social scenes as well as relaxing sun-tanning spots. The northern coast of Peru is another under-the-radar destination, as most travelers tend to stay around Lima, visiting the narrow beach at the bottom of the Miraflores cliffs. Meanwhile, Venezuela has many beautiful beaches facing the Caribbean Ocean, especially in the islands of the north coast. Located on an archipelago off the northeast coast of Brazil, this beach is a stunning short stretch of sand with placid waters. It can only be reached by boat or by climbing down the steep rocky slopes on each end, so it isn't particularly good for younger children. 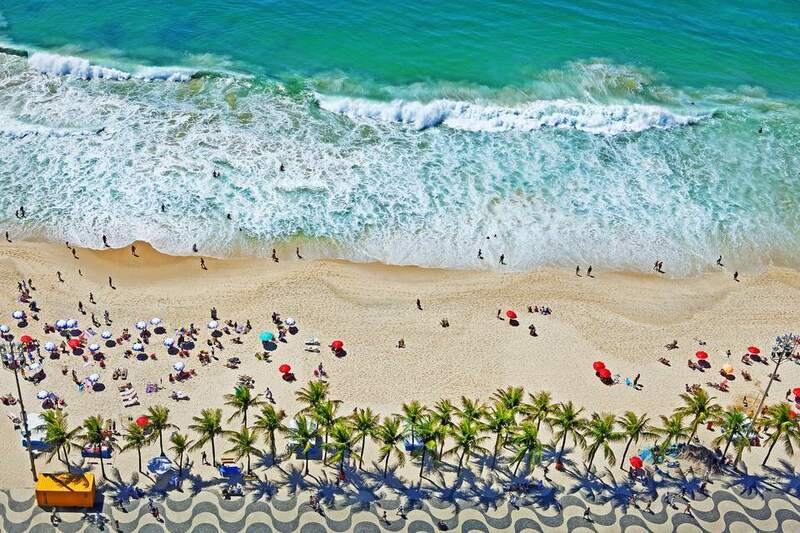 Copacabana is undoubtedly one of the best beaches in South America. With a long strip of bars and nightclubs just off the beach, Copacabana is a beautiful stretch of golden sand that is often crammed with people making the most of their free time. You will mainly find adults and older teenagers on the beach, with the cold water not making for an ideal swimming location, but the beach football and the constant activity during the day make this a great beach for people watching. This remote beach in the northeast of Brazil is one that requires a fair journey but pays off the effort with stunning surroundings and sunsets. The sea isn't ideal for swimming, but there are several lagoons that provide better conditions, while there are also a range of good spots for surfing and windsurfing. Just a short distance from the waterfront towns of Los Organos and Mancora, this lovely beach is often quiet and peaceful and offers some nice shallow water to paddle in for younger children. A little further out, the waves pick up making for fine surfing and windsurfing surroundings, while the charming village offers some nice rustic accommodation. Backing on to hillsides thick with green jungle, this lovely village on the northern coast is ideal for a family getaway. One half of the curved beach is protected from larger waves, making it a calm environment for swimming. The northern half of the 6.5-kilometer beach is a little more exposed, but will often be a little quieter. This beach is split into two by a fishing pier that stretches out into the water, which indicates one of the biggest attractions of visiting Cabo Blanco—the excellent fishing which once drew celebrities such as Ernest Hemingway and Marilyn Monroe. Today, it is a nice stretch of sand where you can relax, and although the waves are too big for children's swimming, they are great if you are looking to hang ten. Near the border with Panama and just a short boat ride from Cartagena, the beach in Capurgana may be small but it is also one of the most beautiful on the continent. A narrow strip of golden sand with just a small number of hotels, this beach is charming with gentle waters that make it good for swimming, while there is also great scuba diving nearby. Located in a national park, this isolated beach is great if you are looking for a quiet place to relax, and the waves here are best for surfing rather than for swimming. However, there is some wonderful wildlife to be spotted here, while there is also a turtle conservation project. This beach is on Isla Baru, just a short boat trip from Cartagena. It is quite popular, so there are some choices in terms of sunbeds and beach bars when you are looking for a drink or a snack, and the south end of the beach is best for a secluded spot, away from where the day trip boats drop off the visitors. Around two miles south of the city center, this beach is very popular among surfers thanks to its great waves. It isn't too rough for swimming either, although a slightly rocky seafloor means you will need to be careful. You will find a few vendors and stalls near the car parking area just off the beach, but on the whole, you will have plenty of space to find a quiet area. This small town is one of the most popular beach destinations in Ecuador, and with great surfing conditions, and waves that are tame enough for stronger swimmers, it is a lovely place to have a beach holiday. This is probably not the destination for young families, however, as Montanita has a reputation as a party town, and this is reflected on the beaches as well as in the town itself. At 17 kilometers in length, you shouldn't struggle to find a tranquil spot on the beach, while the swimming conditions here are also quite good, with moderate waves meaning you'll usually only find beginner and novice surfers here, with board rentals available. If you do fancy breaking up the day, a walk up to the cliffs at the northern end of the beach provides a wonderful panoramic view over the coast. Located within the Los Roques National Park, this stunning beach has beautiful white sand and azure waters that are great for swimming, although the tide can be quite strong, while it is also clear enough to make snorkeling a joy too. Reached by boat, this beach is a true Caribbean gem and is well worth the trip if you are visiting the park. This beach is as close to the stereotype of a Caribbean paradise as you can get, with around four kilometers of golden sand lined with palm trees on one side and the sparkling blue water on the other. Despite its beauty, this isn't really a beach suitable for swimming, as there are some strong currents, and the lifeguards regularly call people back who are getting in too deep. This rustic beach is particularly popular with locals as well as the visitors, and has a few umbrellas and deck chairs, as well as having fairly calm waters that are great for swimming. The beach lies in a bay which backs on to steep mountain slopes covered in greenery, with the palm trees swaying gently in the breeze making for a lovely spot. A curve of golden sand flanked by rocks that stretch out into the ocean, the waters here are quite placid and good for swimming, with plenty of local families often doing the same. The rustic surroundings of the village could easily have been transplanted from Europe, in what is a charming town as well as being a great beach location. Just a short drive from the town of Antofagasta, this beach has some sand dunes that are dwarfed by the high mountains close to the coast. The beach has pleasant white sands and is quite a low-key place, while the water is pleasant for swimming with small waves, while it also has a charming little town nearby too. Argentina's rival to the beaches of Rio de Janeiro, Mar del Plata has beaches just yards away from the city center, and the waves here are good for those looking for good surfing and body boarding. There are plenty of facilities such as sun loungers and beach sports on those beaches nearest the city center, although at the weekend you may struggle to even find a spot to lay your towel. Unlike most cities, Pinamar was actually developed as a planned city, which means that while there are some great facilities and accommodation here, the prices can be a little steep as development is limited. The beach itself is golden with some good waves for surfing, although again this isn't a location for those looking for good family friendly swimming due to the waves and currents.